Members of the Mapeleng community dig the village’s water pipe. Protimos established Lesotho’s first stand-alone public interest legal centre, the Seinoli Legal Centre in 2014. The village of Mapeleng lost access to running water after a dam was constructed to supply water to neighbouring South Africa. 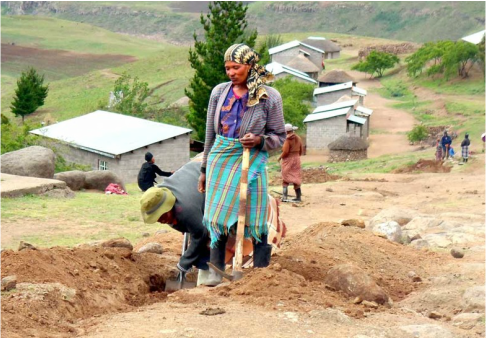 In 2012, the Seinoli Legal Centre obtained a court order which obliged the Lesotho Highlands Development Authority to provide water to the village. The community, after ten years, now has access to clean running water which allows the local economy to grow. ​This precedent will enable other similarly deprived communities to press for the restoration of their water.. The law entitles them to compensation for their lost brushwood, fodder, medicinal plants, which they can then use to create new economic opportunities, following their displacement and the loss of their land. In 2015, the court ruled, after a courtroom battle between Seinoli lawyers and the Lesotho Development Highlands Authority (LHDA), that the community was indeed entitled to receive this compensation. It has now received part of the compensation, and to consider its economic opportunities. The Chief of Ha Lejone holds a copy of the judgment in the 'Ha Lejone Cooperative Vs the LHDA' case.